I left my home in the hands of strangers today and walked away, feeling twitchy, unsettled, a bit like leaving a child behind at playgroup for the first time. The camper was just getting a service, but it has been my home for six months and I’ve clearly bonded. And yes, it does feel like home. I know it’s just a lump of depreciating metal but it contains everything I need and I really like living small, with only the minimum of everything around me; clothes, books, food, recording gear, a slim laptop, camera and phone. And an excess of paper and pens. And while I don’t carry much, I’m prepared for every eventuality. My tents, boots and walking gear are there, working clothes and high heels in the secret (no more) compartment under the floor . They don’t get many outings, but you Just Never Know. 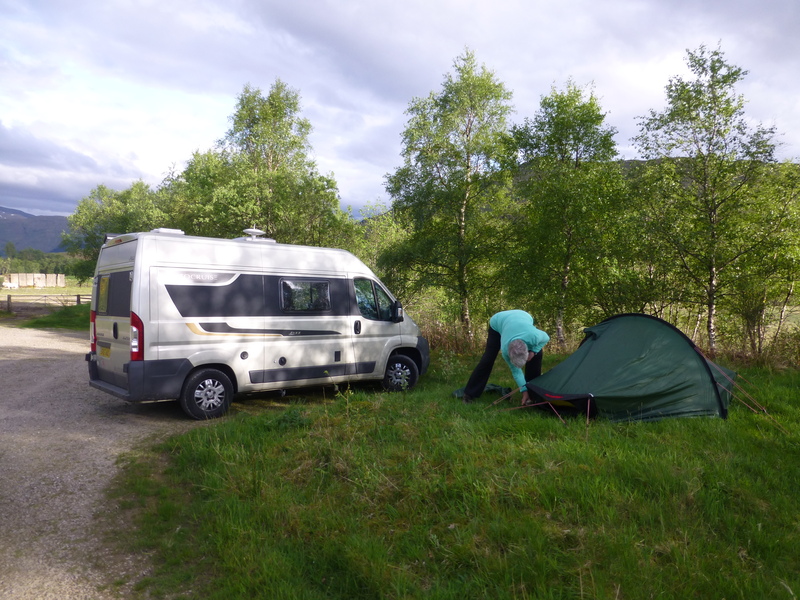 The van works well as transport, office and social space. Friends have stayed over, they’ve drunk wine and whisky and endless cups of tea, I’ve cooked meals in beautiful places as they’ve sat back and enjoyed the scenery. And it’s a pared down personal sanctuary too, a place where I can close the blinds and curl up in bed on a miserable night with hot chocolate and a book. This has been a long, hot, wonderful summer. I’ve wakened early most mornings to the dawn breaking over beaches or hills and fallen asleep to the sound of water tumbling over rocks. There have been remote nights when deer and sheep have been my nearest neighbours and the midges have battered to get in. I’ve spent nights in quiet city streets and car parks too, careful to pull the blinds tight, to shut out the light and keep my presence understated. i’ve been caught in summer storms. And when the tail end of Hurricane Bertha blew in during the wee small hours, it felt a bit like being inside a black out washing machine, battered, shaken and blasted by squall after rocky squall. It was wild and exciting but the van stayed upright and I lay in the tumbling darkness feeling I was part of the weather. But warm and dry. It would be wrong, though, to claim that there are no drawbacks to this nomadic life. I’ve wanted to soak in a bath of hot bubbles after a hard day on the hill, or stare into a log fire on a chilly evening.There have been times when I’ve longed to choose a book from my collection that’s been boxed up in a garage for the last two years. Occasionally I haven’t known which way to turn. Literally. North? Or south? Right or left? On the days when there’s no pressing schedule and no work, the options and horizons are almost too wide. Then there have been weeks like this one, when I’ve been alone in a house, cat sitting for a friend. I’ve had the luxury of space to take stock, to do a thorough spring clean, to get some respite from being in perpetual motion. I’ve barely ventured from the house for the past few days, I’ve driven nowhere and hardly seen anyone or made calls, except for work. I’ve relished being still. Maybe that’s the flaw. Maybe because there are wheels below my bed I feel I need to keep them rolling. It’s coming to an end though. There are just a few weeks left till I need to settle down and hibernate till the long days start to loom again. But I’m not finished with this lifestyle yet. Boy, I love to read your blogs… it sounds lovely! 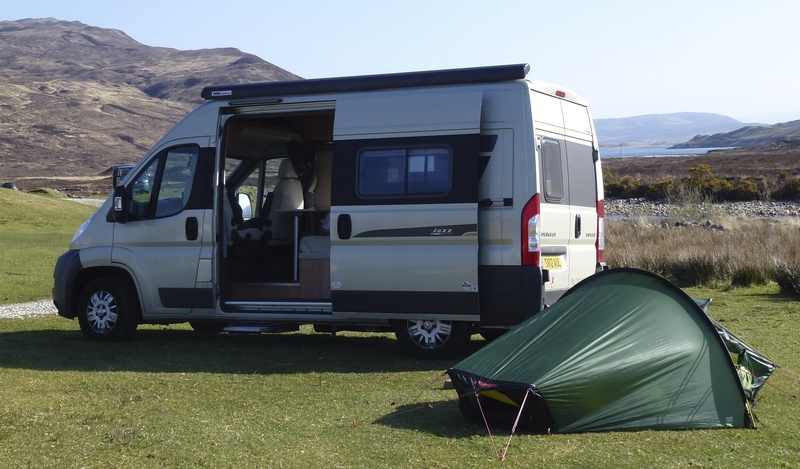 Come on over and see Scotland by camper! And thanks for stopping by Elaine. Hope all’s well with you both. I might have glossed over some of the “realities”! But they’re far outweighed by the benefits. Thank you for your words, they’re appreciated. At the end of your hibernation, you will be ready to head out again with the pleasure of choosing a direction – north, south, east or west! Enjoyed your post very much. I hope you are able to enjoy many hot, bubble baths this winter. Me too! But first I need to find a home base with a bath! I’m putting off hibernation for a few more weeks but it’s getting dark earlier and I need an extra blanket at nights. It’s cosy though, with the blinds down and the patter of rain on the roof. I enjoyed that. My husband and I did the same thing many years ago in a much older camper van. It was a simpler life back then. Beautiful post! Thank you Anneli. Glad my tales are conjuring up memories. I’ve never pictured myself with a motor home, but you’re the second person I know who has made the motor home life on the road look enticing. For now, I’m content with the back of my car. But who knows, after my feline tether no longer holds me in one place…? I have lived out of the back of my car for most of my life – or at least most of my life has been carried around in my car while I’ve worked all over the country. So I know what you mean. This is just a little more ordered. Some of the sweetest prose I’ve read in ages. 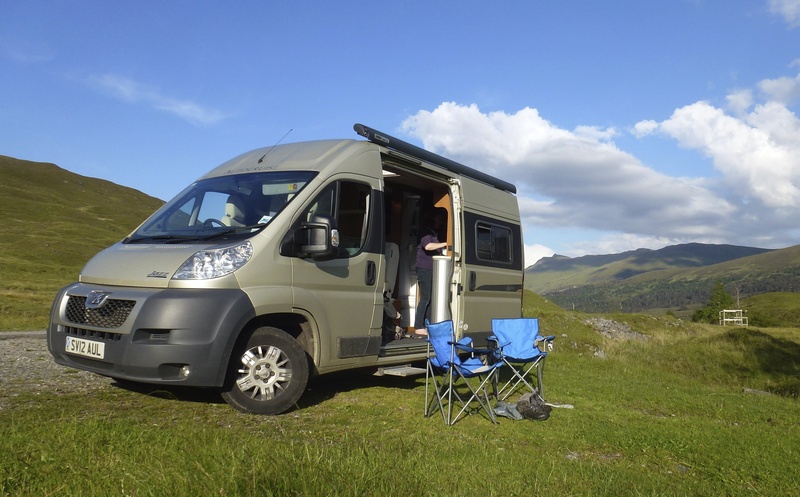 Get a campervan and live in it – sounds like such a simple sentence and a simpler life but with more to it than that. The really lived experience has so much more in it than the simple sentence. You’re right Scott. I tried to envisage what this lifestyle would be like and what the drawbacks would be to being nomadic, and they haven’t turned out to be too serious, largely because I have a few “bases” where friends welcome me and my home for a day or so if I’m passing. Without those roots-by-association I’d feel a little lost I think. Thanks for your kind words. I use the word “envy” sparingly, in fact, rarely. Yet I am, somewhat, of your lifestyle. I know my version/opportunity is coming; it’s been it the making for some time. The prospect of leaving my house in the hands of strangers seems a bit discomforting yet I know all ends well (at least in/with my choices). I am equally encouraged by your words, “But I’m not finished with this lifestyle yet.” 🙂 Great post! Thank you Eric. Ive toyed with adopting this lifestyle for years. It’s a big investment – of faith as well as finance – but I haven’t regretted it … so far! Look forward to reading about your adventure too. 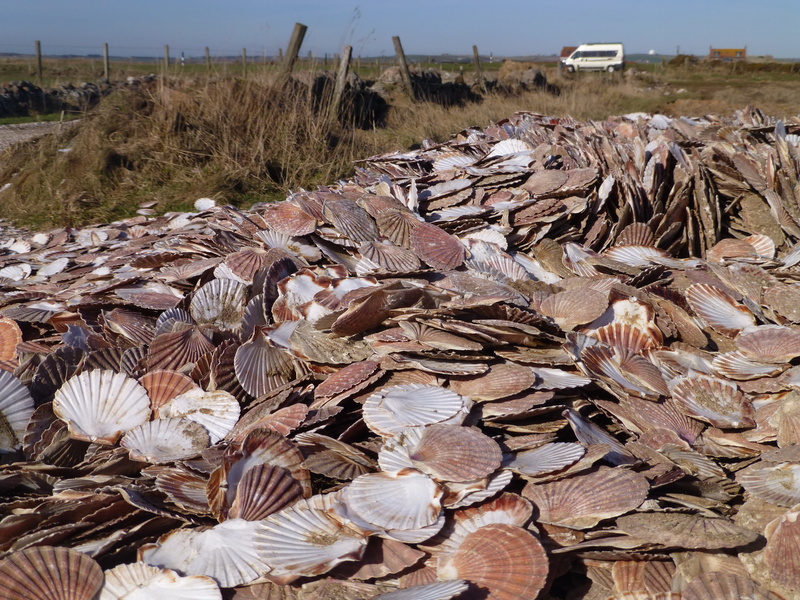 Beautiful words and pictures as usual – I can see those scallop shells beckoning! I retrieved one from the scallop dump and have kept it in the van beside me all summer. And I’m now considering taking it to Spain with me at the end of the month. Seems like the right thing to do. Absolutely. I hope you have better weather than I did when walking to Muxia and Finisterre. We became very soggy, but the sun shone on us as we reached the coast and it was a prefect ending.